The Liberties, an area just southwest of central Dublin, was the industrial engine of the city during the 18th and 19th centuries – and whiskey was its fuel. This is the area where the working class lived and, often, worked. It was home to weavers, to goldsmiths, to brewers, to labourers. It brought money into the country from abroad, it sent money off for new investments. It was a heaving hive of constant commerce. And what did all the working men need to keep toiling away so hard? Well, whiskey, of course. This is Ireland we’re talking about! In the 1800s, there were about 37 whiskey distilleries in Dublin. As well as being drunk by the locals, Irish whiskey was known the world over – and most of it was being made right here in the Liberties. It was ‘smooth’ and had ‘character’ and it looked like this success would last for ever… but it didn’t. The first thing that hit the whiskey business in Ireland was prohibition in the United States in the 1920s. Until then, the Americans had been one of the biggest customers. The second thing that hurt distilleries was Irish independence because Britain banned the importation of Irish goods into most Commonwealth countries. By the 1960s there were just a handful of Irish whiskey distilleries left; by the 1970s there were just two. Don’t cry, though. No need to tearfully nurse a rare glass of Irish whiskey in your hand. Because, as you may know, there has been a resurgence. First, it was the big brands that made a comeback – Jameson, probably being the most famous. And now smaller makers of whiskey are starting to make their mark. One of the most interesting ones is Teeling. The name is not new to Ireland. Walter Teeling began making whiskey in Dublin in 1782 and was pretty good at it, from what I can tell. But his business suffered a similar fate to most. Recently, though, his descendants have decided to get back into the game. Brothers Stephen and Jack Teeling revived the company name and now they’ve opened a new distillery just metres from the original. 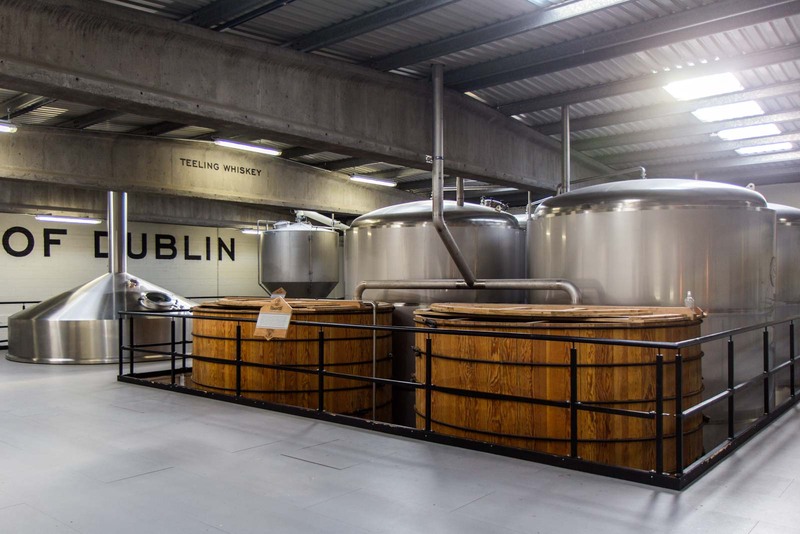 Teeling Whiskey is the first distillery to be built in Dublin in 125 years and it’s the first time in 40 years that any whiskey has been made in the city. It’s also now opened its doors to the public and you can go on a tour to see how it all works. 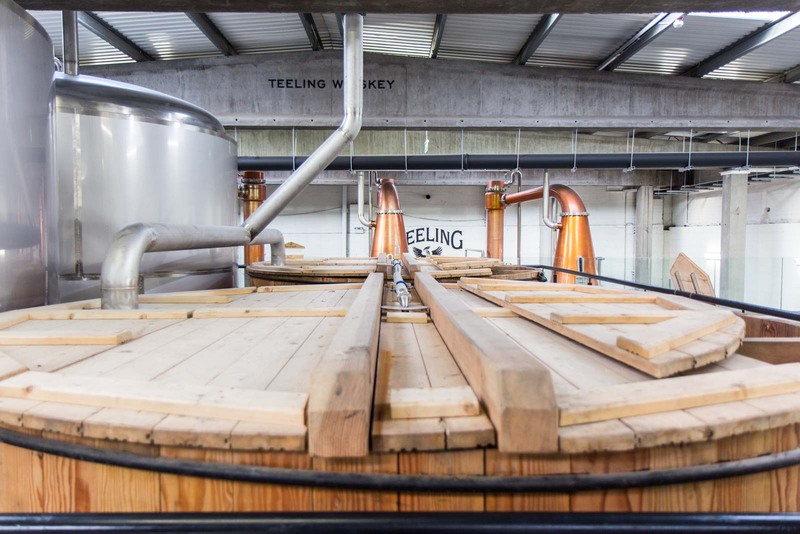 The heart of the Teeling distillery is the three handcrafted copper pots. There’s the 15,000 litre wash still, 10,000 litre intermediate still and the 9,000 litre spirit still. Unlike centuries ago, they are all managed by computer and there’s a sophisticated system that controls the whole process. The steps are still designed by humans, though, and great care is given to the production to make sure the quality is as good as expected. 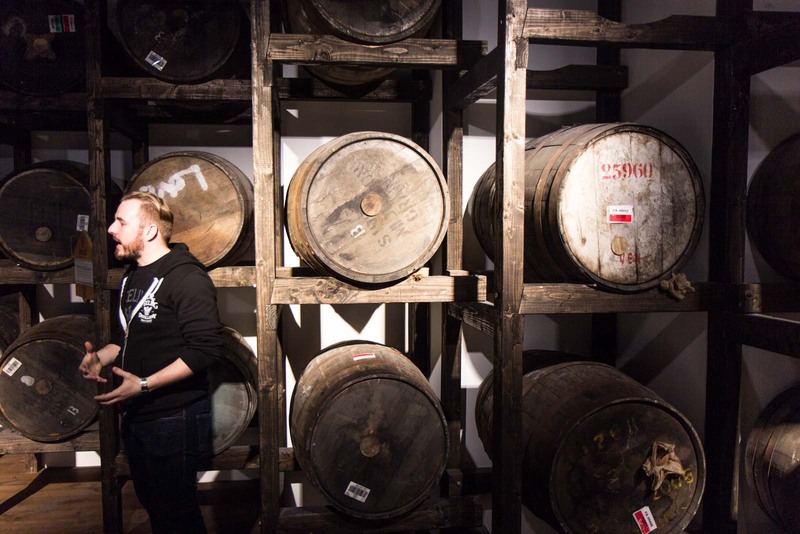 The tour is interesting and will appeal to whiskey aficionados and novices. You learn a bit about the company, a bit about the history of whiskey in Ireland, a bit about the process of distilling whiskey generally and a bit about the specific methods being implemented at Teeling. And, as you would hope (and expect), it ends with a tasting of some of the company’s best bottles. The Teeling story represents well what is happening across the whole country. The craft is coming back, slowly but surely – and with renewed vigour recently. There are 12 whiskey distilleries in Ireland at the moment. Seven of them have opened within the last five years and some are so new they haven’t aged the product for long enough to sell yet. The prediction is that by 2018, Ireland will be producing the same amount of whiskey as it was in 1900, during its heyday. That’s about 12 million cases a year. Expect to see the Teeling brand on many of them. It’s really interesting to see how over time the demand for whisky has grown. Great pictures of a piece of Dublin’s history!